Turkish President Recep Tayyip Erdogan has indicated after talks in Washington that he will never accept a US alliance with Kurdish forces fighting in Syria. "There is no place for terrorist organisations in the future of our region," he said at a joint news conference with President Donald Trump. He was referring to the Syrian Kurdish YPG militia, following a US decision earlier this month to arm the group. Despite this, the two leaders pledged to strengthen bilateral relations. "We've had a great relationship and we will make it even better," President Trump said. 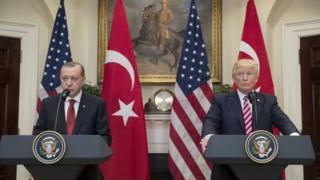 Mr Trump also "reiterated the commitment of the United States to the security of our Nato ally Turkey and the need to work together to confront terrorism in all its forms", the White House said in a statement issued shortly afterwards. Turkey views the YPG (Popular Protection Units), the military wing of the Kurdish Democratic Union Party (PYD), as terrorists and wants to stop them taking more territory in Syria. "It is absolutely unacceptable to take the YPG-PYD into consideration as partners in the region, and it's going against a global agreement we reached," Mr Erdogan said on Tuesday. Ankara says the YPG is as an extension of the outlawed Kurdistan Workers Party (PKK), a group it has been fighting for decades in south-eastern Turkey. The US sees the YPG as distinct from the PKK and also as a key partner in the fight against so-called Islamic State (IS). On 9 May, the Pentagon announced that Kurdish elements of the Syrian Democratic Forces, including the YPG, would be given weapons to help drive IS militants from their Syrian stronghold of Raqqa. SDF forces, which also comprise Arab militias, are already being supported by elite US forces and air strikes from a US-led coalition. The SDF is currently battling for control of the city of Tabqa, an IS command centre just 50km (30 miles) from Raqqa. At Tuesday's talks in Washington, Mr Erdogan also said he had raised the issue of US-based cleric Fethullah Gulen. Ankara blames him for the failed coup last July, pressing for his extradition. Mr Gulen has denied the accusation.